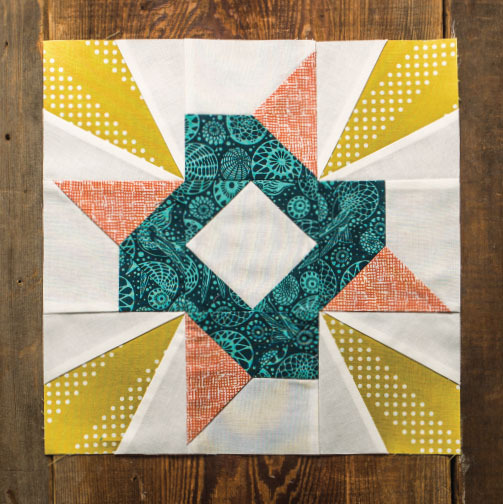 This week’s block is really a fun one because it introduces a brand new unit, which I call a “fancy quarter square triangle”. The cool thing is, it really looks like a Y seam in this particular block due to that dark teal fabric being used in two adjacent blocks. It’s a need aspect of the piecing, which is really pretty simple. The construction is essentially exactly the same as a quarter square triangle, pieced using the drawn line method, but instead of starting with two half square triangles, you use one half square triangle paired with a simple rectangle unit. 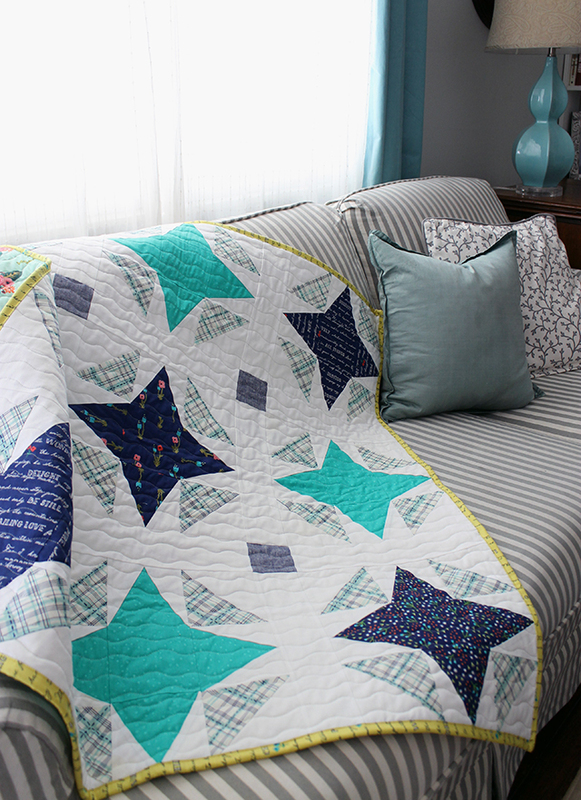 This week I also finished up a cute new baby quilt made from a simplified version of Block 4, Shine. I just love how it turned out! I wanted a quicker, simpler block for this one due to my time constraints, so I used half square triangles in the corners of the blocks instead of the foundation paper pieced diamond units I used for the block in the book. It was a quick sew- only took me about a day! Planning on gifting this to my sweet sister who’s expecting her first baby- a little boy- in April. I showed the quilt this weekend at a paper piecing demo I taught at QuiltCon, using those simple triangle units- they’re perfect for learning the technique, which you’ll need for this weeks’ block, as well as for a variety of blocks throughout the year. 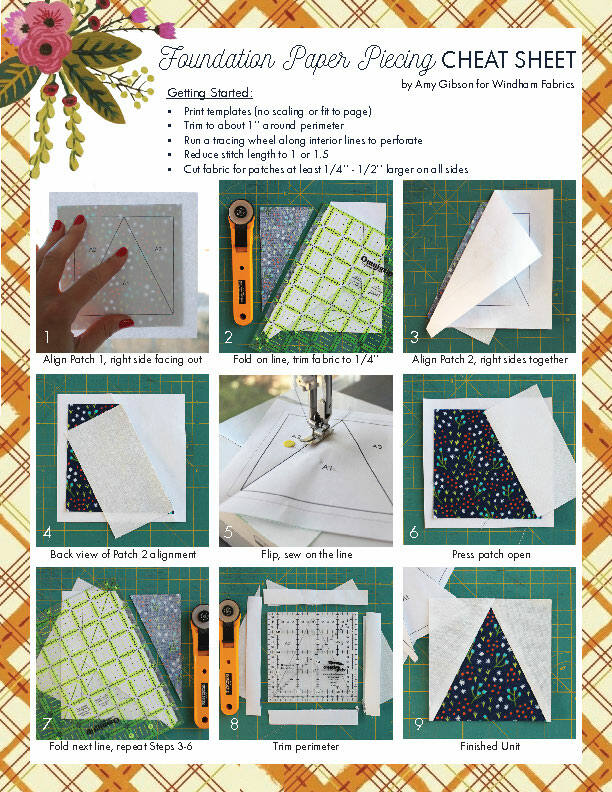 So I thought I’d share with you the little “cheat sheet” handout I made up for the demo, in case it might come in handy- you can print it and keep it by your machine if you need a little reminder of which step comes next (fold, trim, stitch, press…it can get confusing!). You can view the printable PDF version here. Well, that’s this week’s block! Hope you’re having a good week! What a cool block. There are so many variations of quilt blocks yet to be discovered. It takes a creatively curious mind to discover them. Love this block and the cheat sheet is really handy! Thanks for sharing! I will surely use it more than once! 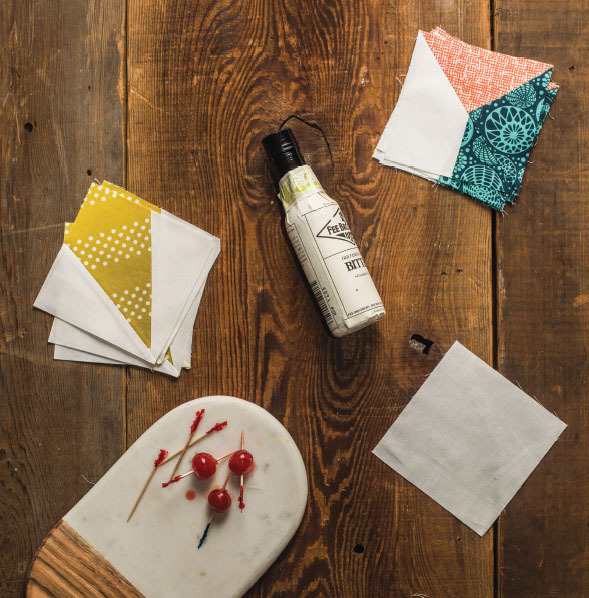 I have reviewed your Craftsy lesson on Foundation Piecing more than once! Love the block but am having trouble making it. The measurements for the wonderful faux y-seam/QST units seem to be off. Looking at previous QST unit, should the measurements for the teal and orange squares be 5.5 in. and the white and teal rectangles be 5.5 x 2.75 in.? Thanks much! Ok, so I am an idiot. The measurements are fine. My interpretation of the instructions on p. 152 were faulty. My sincere apologies! Many thanks. I am having trouble with this as well. can you give me a step by step, I can’t seem to find any answers to this online. Never mind. I guess I should read the directions! Got it! I am having a terrible time on the y seam block. I’ve been quilting for 40 years and I can’t get this to work. Is there a you tube on this somewhere? I just LOVE the creative way you made the fancy quarter square triangle unit! So clever. 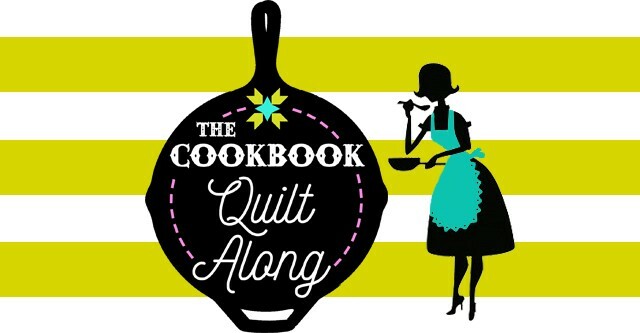 I am really enjoying the book and the quilt-along to show even more ideas.